This year’s Designer Toy Awards feature some great mini-figures and friends of the M.U.S.C.L.E. collecting community. Unfortunately our little community is quite small when compared to others. If we want to see our friends of the M.U.S.C.L.E. community win, then we need to get organized and show our support. These 100% original figures were sculpted by Ironhaus Productions and produced by Eric Nilla (another friend of the M.U.S.C.L.E. community). 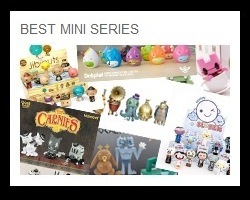 While a proper review has not been posted Hell Turtle and Elephunt are the two best mini-figures this year. Hopefully the epic, but very limited, 2-pack makes a return. Eric Nilla posted a number of UofV pictures on his blog. This line of figures deserves credit not only for its originality and quality – but also its innovation. UofV had a terribly interesting and original sales approach. It found a healthy balance between accessibility, collectibility, extras, and fun without tons of hurdles or frustration. Best Mini Series – Vote for Ironhaus Productions! Not only has Jimmy Rommel from Ironhaus Productions created one outstanding line of mini-figures, he’s created several this year. In fact, he has sculpted and launched so many lines of figures it is difficult to keep track of them all. At least three of them are HORDE, Micro-Bastards, and, the figures seen below, Gorewad Monsters. When people thinking of increasing quantities it’s not uncommon to also think there will be a decline in quality. Not the case with Ironhaus Productions, each line has been a stunning display of skill and creativity. Maybe the greatest mark of talent is other people wanting to collaborate. Again, Ironhaus has had no shortage of collaborators – including: Namu Niku, Tru:Tek, and Rampage Toys. 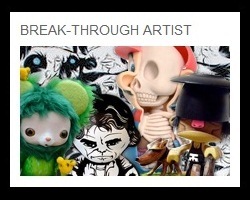 Break-Through Artist – Vote for Ironhaus Productions! Voting is limited to once every 24 hours, so be sure to start each day with a vote! There are quite a few other artists that have previously contributed to the M.U.S.C.L.E. community and mini-figures in general, but there are just too many to name. Unfortunately some of those people are also in direct completion with each other. The University of M.U.S.C.L.E. wishes all of them the best of luck. 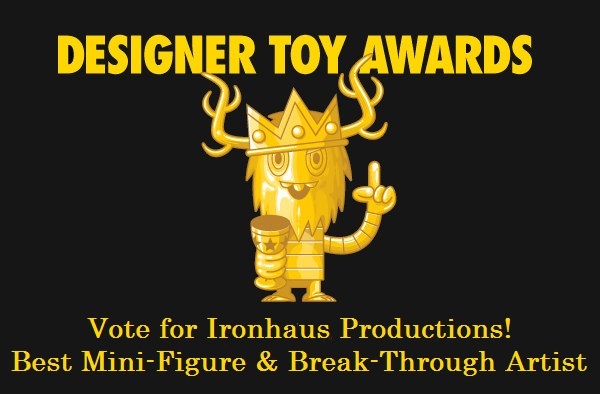 Best Mini Series and Break-Through Artist - Vote for Ironhaus Productions! Altered Picture created from Designer Toy Awards Voting Begins! picture. This entry was posted on Thursday, May 23rd, 2013 and is filed under Art, UofM News. You can follow any responses to this entry through RSS 2.0. You can skip to the end and leave a response. Pinging is currently not allowed. Art 300: Universe of Violence – Boss Figure #2: Elephunt | University of M.U.S.C.L.E.